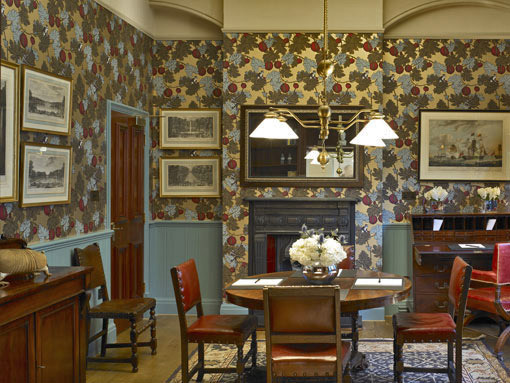 Matthew Godley worked on The Commander in association with the architects Mackenzie Wheeler to create the first floor private rooms, which included the Library (Photos 1, 2 and 3) and the Hereford room (Photos 4 and 5). In both rooms Matthew has chosen a selection of 19th Century antiques. He has also taken care to ensure both rooms are equipped with the necessary modern technology to allow them to function as meeting rooms, without affecting the domestic feel of the spaces. Matthew has styled both rooms using a warm palette of colors. In the dining room he chose a yellow and pink floral print and in the library he selected a rich gold fornasetti wallpaper.